Also teaches in Bermuda, I have taught in London, Oxford, Pennsylvania and India. 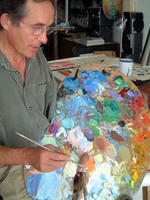 Trained at the Ruskin school of Drawing, University of Oxford, in the 1970s, I have always worked as an artist-designer. Primarily a landscape and portrait painter, I also run a design workshop in Lyme Regis, Dorset, printing hand blocked wallpapers. In training my small workforce, I found there was a wide appetite for discovering the elements of simple pattern making, and the principles of turning a plant study into a design. No experience is needed to learn the theory of repeat patterns by cutting a block and printing a length by hand. My Wallpaper Weekend Workshops are run several times a year in Dorset' and elsewhere. I am prepared to travel to run a course. Come and discover elements of simple pattern and principles of turning a plant study into a design. Learn the theory of repeat patterns by cutting a block and printing a length by hand. No experience or equipment needed. The workshop will be held in my studio in Lyme Regis. £225 includes all materials. Limited places, so early booking recommended. Another weekend is planned in spring 2012.